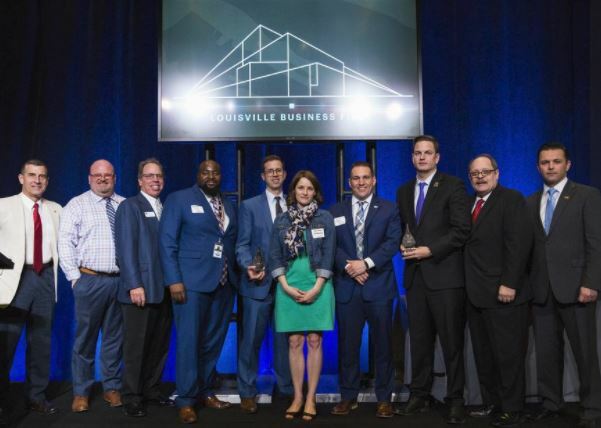 Grisanti Group Commercial Real Estate was honored yesterday at the 2018 Business First Commercial Real Estate Champions event. The deal that was named an honoree at the event was Diversified Consultants Inc.’s 2017 office lease for which Grisanti Group acted as Tenant Representative. This project was one of 18 honorees to be recognized for their major impact on Louisville. Grisanti Group provided advised Jacksonville-based DCI throughout this project to locate its new call center in Louisville. DCI leased 60,000SF of office in Commerce Crossings Business Park at 5100 Interchange Drive. This project began back in 2016 with an extensive search for suitable properties to meet DCI’s challenging specifications. Grisanti Group and DCI’s project team reviewed numerous properties, and ultimately determined that the Commerce Crossings building was the right fit. Nick Grisanti negotiated the deal with landlord Capstone Realty in late 2016 into early 2017. Nick also assisted DCI in arranging a job-creation tax incentive package from the Kentucky Cabinet for Economic Development and City of Louisville. Initially, DCI leased 40,000SF with a right of first opportunity on remaining space 20,000SF in the building. In late summer 2017, another tenant began seriously considering a lease the remaining space. DCI opted to exercise its right of first opportunity and lease up the remainder of the building. Since that time, the entire building has be renovated to DCI’s specs. DCI is steadily filling the space up with new employees, and aims to hire 1,000 workers within the next few years. If your company is looking for office, industrial, or retail space, reach out to the professionals at Grisanti Group. There is no harder-working team than us, and we will go above and beyond to find the perfect space for our buyer and tenant clients.